BEVERLEA WALZ PHOTO | Kelsey McGayhey and Chris Evangelista with their jerseys. Their numbers have been retired. The crowning moment at last Tuesday night’s Shelter Island High School Athletic Awards celebration was the official retirement of the numbers of two athletes — one senior and the other a 2005 graduate — who each scored more than 1,000 points in their high school basketball careers. Chris Evangelista, the 2005 graduate, and Kelsey McGayhey stood on stage with their jerseys — hers is number 23 and his is 10 — during the ceremony at which Athletic Director Rick Osmer announced the retirements. The historic garments will be displayed in the school gymnasium. Ms. McGayhey was the first female at the school to ever hit 1,000 points. 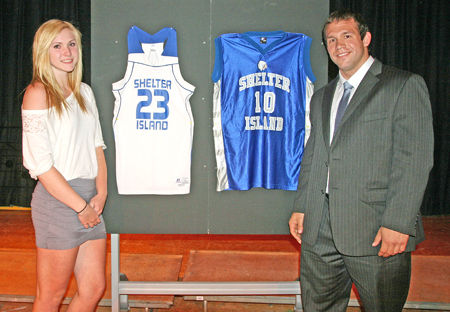 The top honors of the evening, the Shelter Island Sportsman Awards, went to Hunter Starzee and Alexis Gibbs. Mr. Starzee played varsity golf and was Coach Jay Card Jr.’s choice for his Most Valuable Player Award. He played varsity boys basketball as well. Coach Mike Mundy described him as “the workhorse of our team.” He also played on the junior varsity boys baseball team. Ms. Gibbs took home the Coach’s Award in sailing. Varsity Sailing Club Coach Peter Needham said that, while she had little experience, she volunteered to skipper and learned quickly and worked hard. Ms. Gibbs also played varsity volleyball and basketball and has been singled out for her rebounding and blocking abilities as well as scoring. Gold Key Awards for athletes who participated in sports in all but one season of their high school careers went to Ms. McGayhey and Alex Graffagnino. Besides playing varsity basketball, Ms. McGayhey played varsity volleyball, a sport she will continue to play in Springfield College next year. She received the All County Award and was named League VIII Player of the Year. Mr. Graffagnino was a key player on the varsity boys basketball and varsity soccer teams. Breanna Hallman and Jimmy Read received Army National Scholar Athlete Awards presented by Staff Sergeant Reid Hollingworth. Megan Mundy and Jon LiCausi took home Suffolk Zone Fitness Awards, the highest awards for physical education achievements. Scholar athletes, all of whom achieved at least a 90 average for the first three quarters of the school year, were: Kelly Colligan, Kenna McCarthy, Olivia Garrison, Caitlyn Mulcahy, Matthew BeltCappellino, Erin Colligan, Drew Garrison, Brianna Kimmelmann, Melissa Ames, Katy Binder, Jillian Calabro, Jayme Clark, Lea Giambruno, Lisa Kaasik, Morgan McCarthy, Tara Sturges, Jay Card, Alex Graffagnino, Breanna Hallman, Jimmy Read and Haley Willumsen. Varsity golf Coach Card noted that when he started with the team five years ago, it was “the doormat of the league,” but this year the team missed the league title by a single stoke. He named Mr. Starzee his MVP and his son, Jay, received the Coach’s Award. Both were named All County golfers, he said. Varsity volleyball Coach Cindy Belt, whose team took the league championship this year, named Ms. McGayhey and Haley Willumsen as MVPs and presented the Coach’s Award to Katy Binder, whom she called “my rock,” a player who helped pull the team together and calm players’ nerves. Junior varsity volleyball Coach Karen Gibbs named Tiearza Lawrence her MVP and presented Coach’s Awards to Kenna McCarthy and Logan Pendergrass. “We started out loving each other and then we hated each other and I think we loved each other by the end of the year,” she said about her team. Junior varsity tennis Coach Sue Warner, whose team had a winning year with an 11-1 record, gave Lisa Kaasik the MVP award, noting she had won 288 matches with 42 losses over a two-year period. Serina Kaasik took the Coach’s Award with Ms. Warner noting she was the team’s most improved player. The varsity boys basketball record, 4-13, didn’t really reflect the way the team played, Mr. Mundy said. “We were a team on the cusp,” losing a number of games by narrow, even one-point margins. He noted that Shelter Island beat Greenport when Greenport was the number one team in the league. Jimmy Read was named MVP and Matthew BeltCappellino received the Coach’s Award. Mr. Card, who also coached junior varsity basketball this year, said his job was to get his players ready to play varsity in the future. He named Riley Willumsen his MVP, saying he “made us go all year.” He gave the Coach’s Award to Bac Tran, a Vietnamese exchange student who had never played basketball before coming to Shelter Island. “He worked his tail off,” Mr. Card said. He departed from the formal awards to give wooden shoes — symbols of his Dutch heritage — to Haley Willumsen and Breanna Hallman. Ms. Hallman was “the driving force behind the practices,” Mr. Miedema said. When Ms. Willumsen started playing, she told her coach she didn’t like basketball and wouldn’t continue. But the next year she was back and playing very effectively, the coach said. In presenting junior varsity girls basketball awards, Coach Brian Doelger said the year was special for him and that teaching and coaching are jobs he would do for free because he loves working with students. He named Abbie Ross-Gates his MVP, saying she “single-handedly won early games when others, new to basketball, were still learning. Erin Colligan flew under the radar all year,” but contributed to the team’s success, earning Mr. Doelger’s Coach’s Award. Concluding a 9-3 season, the boys junior varsity baseball team will become a varsity team in September, Coach Miedema said. “I guess we’ll have a lot to learn next year,” the coach said. He named Nathan Mundy his MVP and gave his Coach’s Award to Matthew BeltCappellino. Melissa Ames is the varsity Sailing Club’s MVP. Greenport Athletic Director Todd Gulluscio was on hand to honor Shelter Island players on combined teams — varsity and junior varsity soccer, junior varsity football and varsity and junior varsity field hockey. “Combined sports is a wonderful thing,” Mr. Gulluscio said. There were no awards for those hard-working cheerleaders who supported teams, but Coach Kimberly Clark had praise for the girls who performed regularly at games and pep rallies. Superintendent Michael Hynes capped the evening, announcing that a tribute to athletes will be set up outside the gymnasium. It will be similar to the tribute to scholars in the lobby outside the auditorium.